The pupils were kidnapped in the night and their hostels were burnt. However, while Boko Haram transported them in trucks to its Sambisa Forest stronghold, over 50 of the schoolgirls escaped from the sect. There have been reports that some of the girls have been seen being moved out of Nigeria. Other reports have said the girls were seen in the northern parts of the Central African Republic where an Islamic militia, Seleka, holds sway. Last week, the leader of the sect, Abubakar Shekau, in a video asked for the release of Boko Haram detainees in exchange for the pupils. The Federal Government turned down the request. 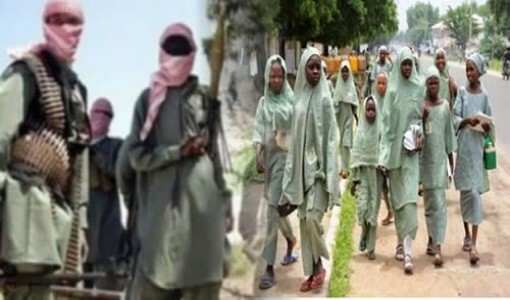 On Saturday, the Principal of Government College, Makurdi, Mr. Godfrey Ugudu, revealed that the school had received letters from Boko Haram threatening to attack the school. The News Agency of Nigeria reports that Ugudu, who announced this at a news conference in Makurdi, added that the school received two letters which had the same content on May 14. “It is true that we saw two letters informing us of the intention of the sect to invade our school on Friday or Monday by Boko Haram. The school principal added that in the letter, Boko Haram also threatened to arrest another nearby school. “In the letter, we were asked to inform the Mount Saint Gabriel Secondary School opposite us to also get prepared as they promised to invade the school too. “We immediately alerted the police and the commissioner for education. A report has been made to the governor on the issue. “The two letters, which were written in pidgin English, were sighted inside one of the classrooms and the second one was slipped into the staff room,” he said. The principal commended the government and security operatives in the state for their prompt response to the issue. He said measures had been put in place to ensure the safety of the school children, adding that he had informed the Principal of Mount Saint Gabriel. NAN reports that about 500 out of about 700 students of the college are living in the school while Mount Saint Gabriel is purely a boarding school. The Police Public Relations Officer in the state, Dan Ezeala, confirmed the report adding that police were on top of the situation. When SUNDAY PUNCH contacted the Director of Defence Information, Maj. Gen Chris Olukolade, he asked our correspondent to speak to the police and the school authorities. “I think you should talk to the police and the schools. The security agencies are in the states are supposed to be operating,” he said. The Force Public Relations Officer, Frank Mba, could not be reached for comments as calls made to his phone failed to connect. A text message sent to his phone was not responded to as of the time of filing this report. Meanwhile, the drones and other surveillance aircraft deployed by the US government to search for the over 200 abducted pupils have yet to locate them. While promising to intensify efforts to find the schoolgirls, US Defence Secretary, Chuk Hagel, told the Cable Network News, that the pupils had not been seen. “I have seen no intelligence come back that I am aware of that shows that we’ve located those girls,” he reportedly said on Wednesday. This came amid reports that the US would not share intelligence data with Nigeria. Pentagon spokesman, Col. Steve Warren, was quoted to have said the US was disposed to sharing commercial satellite imagery with Nigeria, but not raw military data. “At this point, we are not sharing raw intelligence data,” Warren said. He did not give reasons for this. But the US is known not to share intelligence with governments its officials adjudge to be careless with intelligence information. Efforts by SUNDAY PUNCH to find out if there had been any new development did not yield results. The Public Affairs Officer of the US Embassy, Sani Mohammed, on Friday asked our correspondent to send his question via email, but as of the time this report was filed, he had yet to reply to the mail. Meanwhile, the Chairman of the National Information Centre, Mr. Mike Omeri, has told one of our correspondents that Nigeria will adopt “global best practices” to ensure that the Chibok girls were freed. Omeri stated this in a telephone interview while responding to an enquiry from SUNDAY PUNCH. He was asked whether or not the government had changed its position that it would not exchange the girls for the detained Boko Haram members. The NIC chairman said, “All options are on the table. Nigeria will adopt international best practices to ensure the girls are free. This entry was posted in Breaking News, Men, Teens 14 - 19 years of age. and tagged BOKO HARAM: We Need Schoolboys To Wed Chibok Girls.